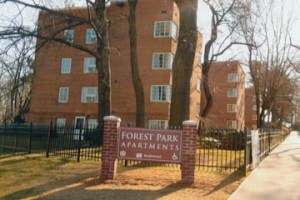 Built in the 1950s as a highly desirable 211 apartment complex, Forest Park Apartments was converted to condominiums in 1988 and rapidly deteriorated due to fragmented investor ownership. Stymied in its efforts to bring the site up to code, CCS undertook a three and a half year Housing Court battle which resulted in relocation of residents and condemnation and boarding up of all buildings. In 2009 Winn Development Corporation acquired the development, reduced its size to 111 completely rehabilitated units and installed new landscaping. Winn continues to manage Forest Park Apartments which is once again a neighborhood asset.